I’ve got a new entry in my Event Horizon column over at The Comics Journal. This on is about Batman: Son of the Demon (BSOTD) by Mike W. Barr and Jerry Bingham. I did a lot of writing around this episode, much of which didn’t make the final cut. Here’s a bit that got left on the cutting room floor. One thing I found myself struggling with is the large body of Batman literature. Much of this literature is very similar to itself, with small differences. The more I thought about it, the more it resembled a fractal structure. 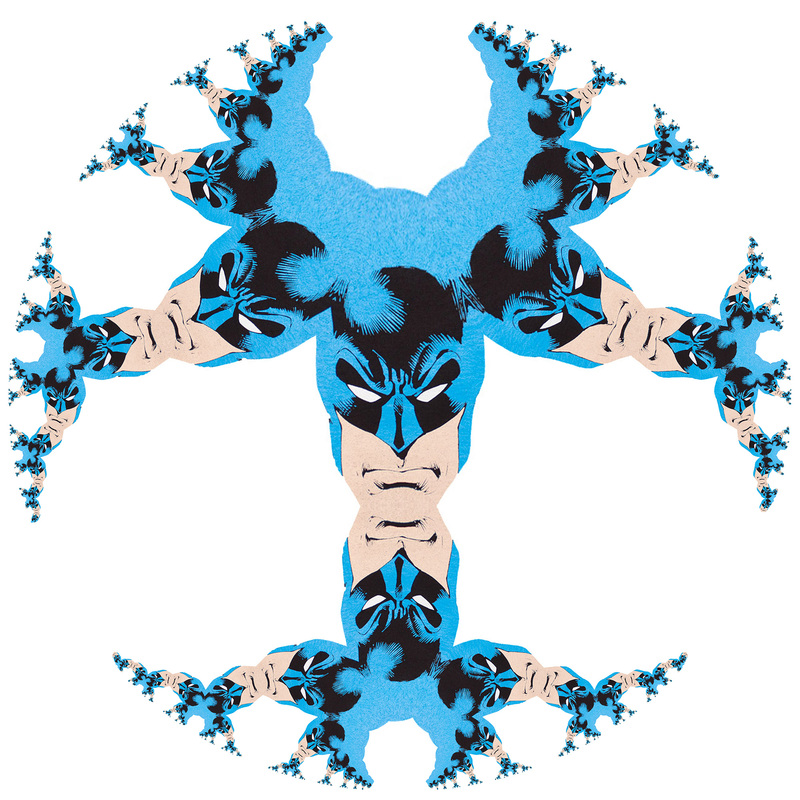 And when zooming out on this fractal, Batman and superheroes in general acquire a fractal self-similarity. But I get ahead of myself. If you’re critical of a work like this, is it because you don’t ‘get it’? Is it because you’re not a fan, and haven’t taken the time to become more familiar with Batman mythos? Is it not for you? Or, is it possible to consider BSOTD out of the general Batman context and say something meaningful about it? This doesn’t even begin to tackle Batman in the context of the broader DC Multiverse; all of his guest appearances, his relationships with Superman, Wonder Woman, The Justice League, and many of the other DC superheroes. Does any of that matter? Or, can you just write about BSOTD? I have read many Batman comics, seen most of the ’66 TV show and all the Batman films since Tim Burton’s. Even with all this, I have not read more Batman, than I have read. This of course is true of just about anything. During our lifetime we will have not read more than we will have read. One way is to just not worry about it too much. Each Batman incarnation fits the era in which it was created. Each Batman era owes as much to the general cultural context, as to the writer/artist/editor team that worked on the comics. All that said, when you read a Batman comic, no matter how out of continuity, and how random, if you have read other Batman comics, and other superhero comics, most likely it’ll have a quality similar to those other comics. There’s a self-similarity to superhero stories in general. A self-similar object “is exactly or approximately similar to a part of itself (i.e. the whole has the same shape as one or more of the parts).” [Wikipedia] Batman is like that. On transcendental level, Batman is a set of characteristics and story tropes. When looked at from a distance each part of the Batman canon is like another part. As you zoom in there are differences of course. But the differences circle around repetitions; like a fractal. Anyway, back to the column. In this episode I start to zero-in on some of the general qualities of comics of the Event. (What is the Event? 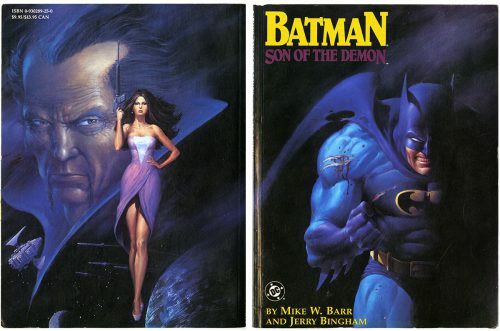 Read the introduction) This time I read Batman: Son of the Demon (BSOTD) by Mike W. Barr and Jerry Bingham. It’s a more traditional entry into the Event Horizon narrative. I created a handy little chart that maps various Event titles onto art-narrative axes and with an experimental-to-traditional scale for each. Comics of the Event can be mapped onto a fourfold structure of two intersecting axes. On the horizontal axis, we have the ‘art’ continuum, which ranges from experimental (or innovative) on one end, to traditional on the other. The vertical axis is ‘narrative,’ which has a similar range. Because comics are a unique melding of narrative and image, the intersections between these two continuums can result in unusual juxtapositions. 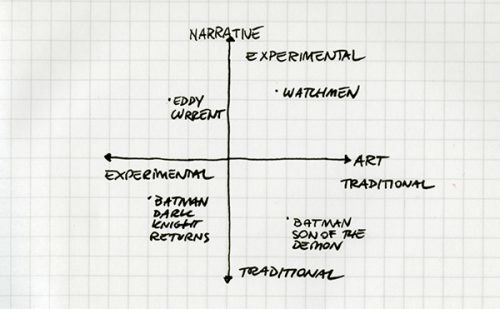 Traditional narratives can be executed in experimental art styles, and experimental narratives might be assigned a traditional artist. These discrepancies were intensified during the Event, especially in commercial comics published by Marvel, DC, and other publishers where writer and artist are distinct figures. At some point in the future I’ll probably come back to the fractal self-similarity of superheroes. But for now, read the new Even Horizon column here.